Last month we had the pleasure to visit the city of love. For the both of us it was already our second time in Paris this year, but we simply just can’t get enough of the beauty and atmosphere of the city. Literally each and every corner seems to be so picture perfect! So was the hotel we stayed in: 1er Etage Opera. 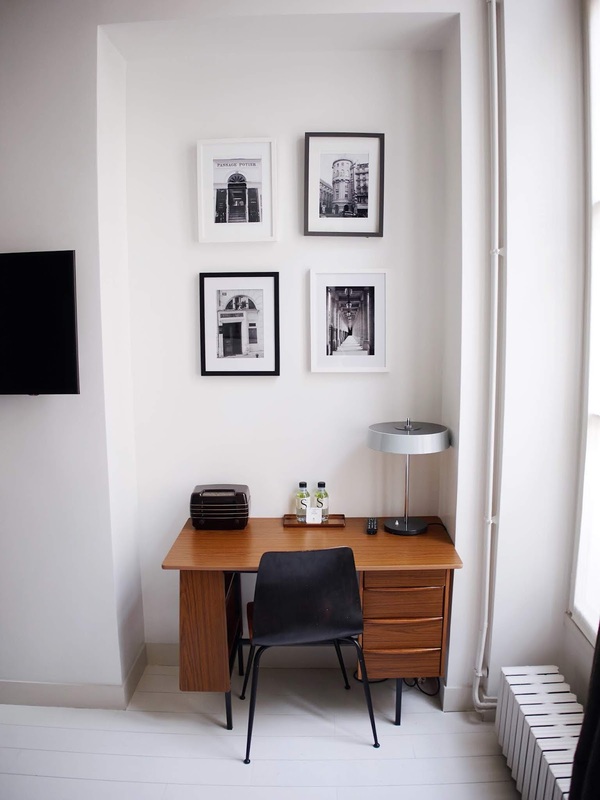 The hotel is located at the first floor of a typical Parisian building (close to the Opera and Galeries Lafayette) including an enormous front door and cute courtyard. This perfect location made it possible to see most of the highlights of the city by foot – even Montmartre is within walking distance. When we first entered our deluxe room we were impressed by the cool and minimalistic interior. Think of white walls with several Parisian prints, a beautifully decorated open bathroom and big comfortable bed. In the evenings we made sure to take a super long bath before going to sleep, which was such a blast after a long day of exploring Paris. What we also really liked about the hotel was the walk-in kitchen where you could make your own cup of coffee or tea or get chocolates, cookies or sweets - this made us feel like home! Breakfast at the hotel (croissants, baguette, fresh fruits, cappuccino) was partly served by a hospitable girl, supplemented by a small breakfast buffet including raw ham, jam, different cheeses (goat cheese – yum! ), yogurt, homemade granola and so on. Everything tasted so good, and also the atmosphere in the breakfast room was really comfortable and felt a bit like being in someones living room. So in case you’re looking for a super comfortable and well decorated place to stay (on a perfect location) during your visit in Paris we would most surely recommend 1er Etage Opera. Thanks for making our stay in Paris even more perfect!